Gotstyle is a menswear shop that filled a much-needed shopping gap for Toronto's dapper male-folk. I gotta say, guys, you really get ripped off in the fashion department. Unless you have the dough to buy ultra-high-end, the affordable options tend to be boxy, void of colour, and Yawnsville. I hear this complaint constantly. Gotstyle falls neatly in the middle, offering under-$1000 full suits in current slim cuts, and casual apparel infused with saturated hues. 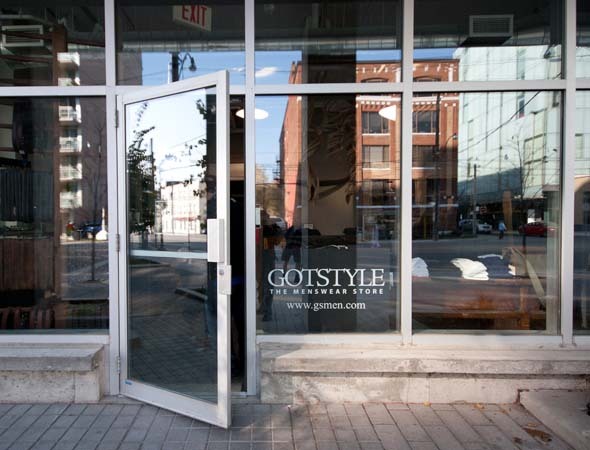 Gotstyle's migration from their old 2nd-floor King Street location to new street-level Bathurst and Wellington digs only required closing shop for a couple of days. Owner Melissa Austria tells me that it was business as usual for "The Menswear Shop" even during construction. On my visit, a mere two weeks after opening, the only remaining signs of reno are in the yet unfinished barber shop. This service, moved from the old location, is provided by Pamela who is described as "part barber, part psychiatrist". While the barber shop takes shape, Melissa laughs that there are "a lot of disheveled men in Toronto" right now. 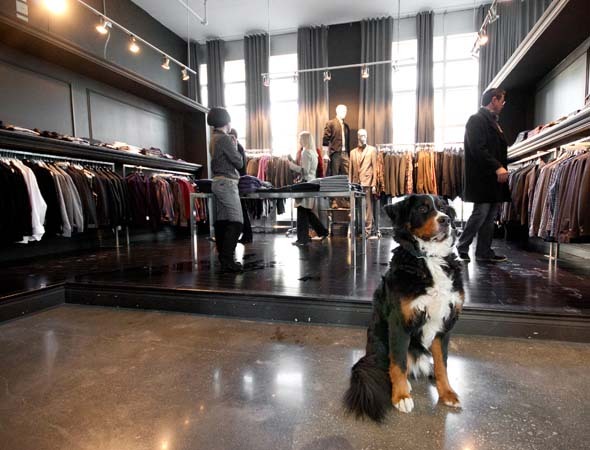 Also, Gotstyle's resident "greeter" - Hector, the Bernese Mountain Dog - has resumed his duties in the new location. The new space is roughly the same square-footage as the old, but the difference is in the layout. Previously, the open concept was overwhelming for Melissa's customers. She addressed this concern in the new location by creating an intimate feel via sections separated by occasion. 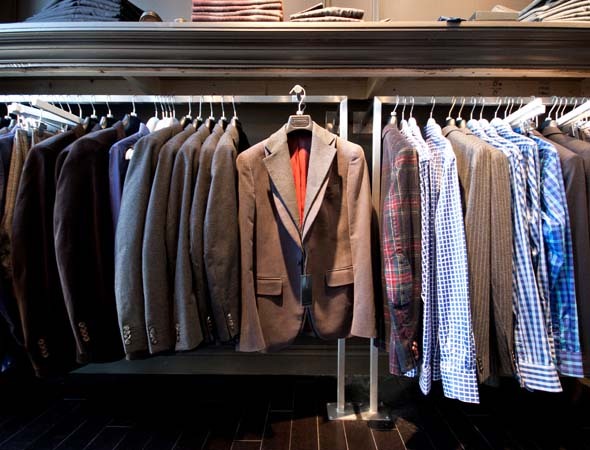 Casual clothing flows into social wear ("going-out clothes") then into formal suiting at the rear of the store. The details are divine - dark wood antiques contrast beautifully against modern concrete floors and rich dove-grey velvet dressing room curtains. I spend time browsing the social shop, marveling at how colours like royal blue, purple and deep teal can do so much for the typical neutral palette of menswear. Melissa has made it her mission to get men away from denim, and pushes "alternative bottoms" - pants that are made from traditional fabrics, but in modern cuts. 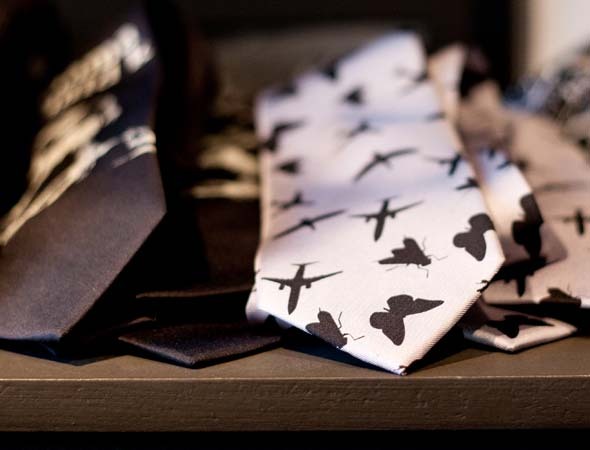 In social wear, I also find adorable plaid and pin dot bowties, and neckties with cheeky prints. Boys, it's finally time to have fun with fashion! Of note are Full Circle wool cardigans (these are not your Grandpa's sweaters), charcoal Ted Baker blazers with grosgrain piping and gorgeous lining, and lots of Canadian designer representation. In suiting, Melissa explains that any body type can wear a modern fitted suit. The idea is "trim" not "slim". Even stockier builds can pull off the look, I am told. Technicolour ties pop against the dark wood - bold patterns of updated paisley and thick stripes come in purples, intense shades of blue, and even orange. Canadian content rules here, too. Gotstyle's private label suit collection is manufactured in Montreal. 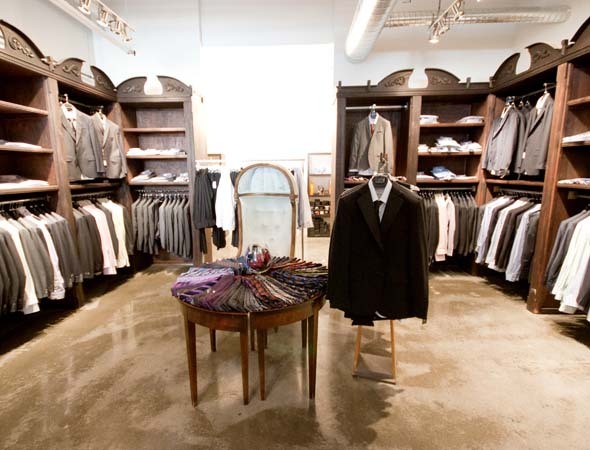 The formal area also houses their made-to-measure service and in-house tailor - services that are becoming more in-demand at the shop these days. 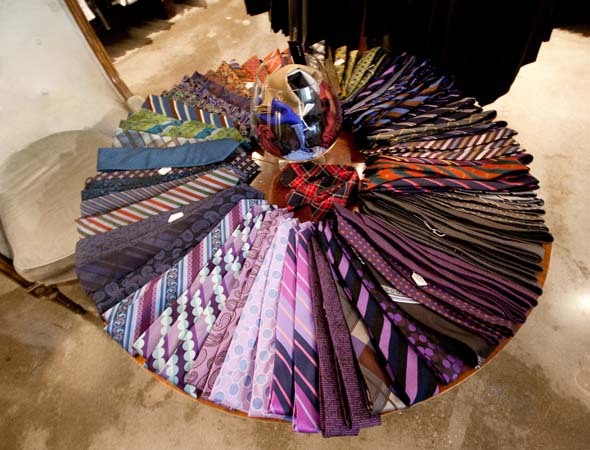 David Clemmer, the new fashion consultant on CBC's Steven & Chris, encouraged men to inject more colour into their wardrobes during a segment that aired last week. Daunting as it may be for some men, Gotstyle proves that it's easier than it looks. Go see Melissa. Tell her I sent you. Photos by Dennis Marciniak .